Ominous noises from AG Sessions on marijuana and drug policy, asset forfeiture reform advances in three states, the feds threaten to shut down the Las Vegas Cannabis Cup, and more. 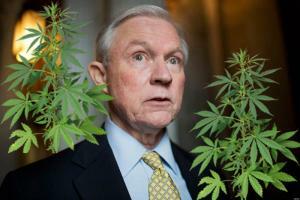 Sessions Makes Ominous Noises on Marijuana Policy. Attorney General Jeff Sessions restated his opposition to marijuana use Monday and warned that marijuana legalization efforts could open states to "violence" and a response from the federal government. "I don't think America is going to be a better place when people of all ages, and particularly young people, are smoking pot," Sessions said to reporters Monday at the Department of Justice. "I believe it's an unhealthy practice, and current levels of THC in marijuana are very high compared to what they were a few years ago, and we're seeing real violence around that." He had more disturbing things to say Tuesday. See below. Feds Threaten to Shut Down Las Vegas Cannabis Cup. Nevada US Attorney Daniel Bogden has sent a letter to the Moapa Paiute tribe warning that the Cannabis Cup trade show set for tribal lands next weekend would violate federal marijuana prohibition laws. "I am informed that the tribal council is moving forward with the planned marijuana event referred to as the 2017 High Times Cannabis Cup because it is under the impression that the so-called 'Cole Memorandum' and subsequent memoranda from the Department of Justice permit marijuana use, possession and distribution on tribal lands when the state law also permits it. Unfortunately, this is an incorrect interpretation of the Department's position on this issue," Bogden wrote in a February 16 letter. New Mexico Legalization Bill Killed. An effort to legalize marijuana died Monday in the House Business and Industry Committee after members voted 9-1 to kill it. House Bill 89 went down at least in part because of uncertainty surrounding the Trump administration's posture toward legal marijuana. It would have created a 15% tax on marijuana sales from licensed shops, with revenues earmarked for schools, the judiciary, and drug treatment programs. Idaho Civil Asset Forfeiture Reform Bill Advances. A bill to require police to demonstrate an actual connection between drugs and seized property before seizing it and to clarify that possession of cash alone is not grounds for seizure has passed the House Judiciary Committee. House Bill 202 now heads for a House floor vote. Indiana Civil Asset Forfeiture Reform Bill Advances. A bill that would end asset forfeiture without a criminal conviction and would bar prosecutors from circumventing state law by passing cases off to the feds has passed the Senate Committee on Corrections and Criminal Law. Senate Bill 8 now heads for a Senate floor vote. New Mexico Senate Passes Bill to Close Asset Forfeiture Loophole Used By Cities. The Senate has approved Senate Bill 202 on a unanimous vote. The state ended civil asset forfeiture in 2015, but police in Albuquerque and other cities claimed the law did not apply to their municipal asset forfeiture programs. This bill clarifies that it does. It is now before the House Judiciary Committee. Sessions Says DOJ Will Prioritize Drugs, Violent Crime. In remarks before the National Association of Attorneys General Tuesday, US Attorney General Jeff Sessions acknowledged that crime was at historically low levels, but vowed to pursue gun and drug offenses. "[I]llegal drugs flood across our southern border and into cities and towns across our country, bringing violence, addiction and misery. In particular, we've seen an increase in the trafficking of new, low-cost heroin by Mexican drug cartels working with local street gangs,"Sessions said. "As the market for this heroin expands, gangs fight for territory and new customers and neighborhoods are caught in the crossfire,"he continued. "In recent years, we've also seen a significant shift in the priority given to prosecuting gun and drug offenders at the federal level. While numbers don't tell the whole story, I still find the following statistics troubling: at the end of 2015 there were more than 7 percent fewer federal gun prosecutions than five years before. In that same five-year period, federal drug prosecutions declined by 18 percent. "Under my leadership at the Department of Justice, this trend will end,"he said. West Virginia Bill Would Create Mandatory Minimum Sentences for Adults Who Make or Transport Drugs Around Minors. The House of Delegates' Committee on Prevention and Treatment of Substance Abuse has approved House Bill 2648, which would set a three-year mandatory minimum sentence for any adult found guilty of transporting or manufacturing drugs in front of a minor. The bill now heads to the House Judiciary Committee. Poll Has Four of Five Danes Favoring Medical Marijuana. A new survey from Analyse Denmark has support for medical marijuana at 80%, "with the remainder saying they did not have an opinion." The poll comes as the country awaits a medical marijuana pilot project set to begin on January 1. The poll also asked about marijuana legalization, but only 36% were in favor, with 45% opposed.